November Mood Board - It's beginning to look a lot like Christmas! It's Donna here, and I'm so excited to be sharing a card that I made using the November mood board. I love using mood boards, because sometimes it's hard to know where to start, and the mood board gives me direction and inspiration. We'd love to see what others do with the mood board, so don't forget to share and tag us if you play along. All the links are at the bottom of this post! I stamped the beautiful images from the "Grace's Little Note" stamp set, and heat embossed them with gold glitter embossing powder on a piece of watercolour paper. I then watercolored the flowers using three layers of red and pink, and coloured between the flowers with raw sienna. 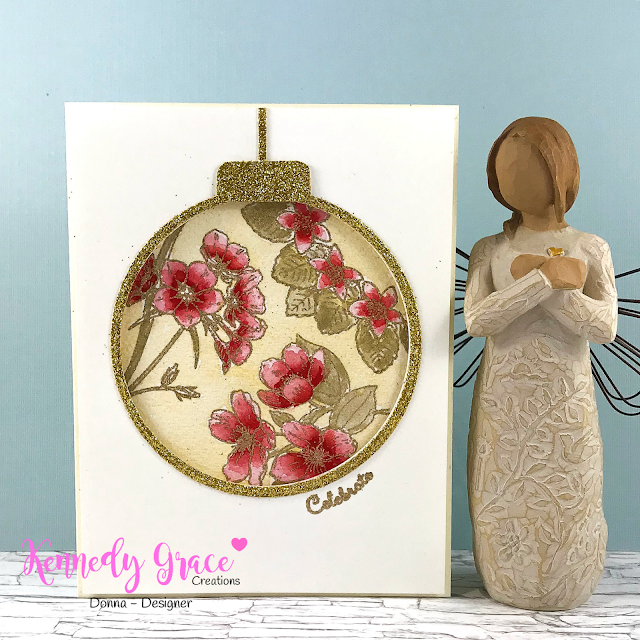 I stamped the word Celebrate, from the same stamp set as the flowers, and gold embossed this too, In order to match the shape of the design, I stretched the stamp into a curve. The top panel is popped up with foam tape to give the card a bit of dimension. Have you seen the mood board that I used as inspiration? Here's a look at it. 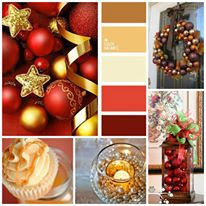 You can see that I was inspired by the lovely colour palette, and the Christmas baubles. So I look forward to seeing more creations using this lovely mood board! Until next time, may your days be full of sparkle! Tis the Season...to make Christmas Cards!! Combine Your Stamps with Kennedy Grace Creations.